Driving while on the phone is a criminal offence. If you are caught using your mobile phone when driving, you may be given the chance take a fixed penalty. For offences committed on or after 1 March 2017, the fixed penalty is 6 points and £200. 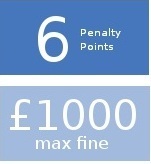 For incidents before that, the fixed penalty is £100 and 3 points. To take up a fixed penalty, you can attend at the fines office of your local court. Your payment will be taken and penalty points will be recorded against your licence. Many people do not agree with the police that they were using their phones. In these cases, you can contest the matter in court. To do this, simply ignore the fixed penalty ticket. The police will then refer the matter to the local prosecutor, called the Procurator Fiscal. The Procurator Fiscal will write to you within a few months, giving you a date for court. For advice on what you should do to prepare for court at this stage, contact us for a free consultation. If you already have 6 points or more on your licence, you will be prosecuted in court for driving while on the phone. If you are convicted, the court will put 6 points on your licence and give you a fine of up to £1000 (if you are driving a goods or passenger vehicle, mobile phone driving is considered more serious: the fine can then be up to £2500). If the offence is particularly serious, the court has the option of banning you from driving. It is likely that the case against you will be short and simple. It will centre on the evidence of the two police officers who observed you in your car. Typically, they will have seen you holding something to your ear whilst appearing to talk. They’ll state in court you were driving while on the phone. If you would like us to prepare a forensic examination of the case against you, examine your lines of defence and explain mobile phone law, please be in touch. Mobile phone use is a contravention of the Construction & Use Regulations. It is made a criminal offence under the Road Traffic Act 1988. The attitude of Justices of the Peace to this offence is to consider it a matter concerning road safety, rather than simply a technical breach of the Regulations. Despite this, there is a fixed statutory number of penalty points imposed in for all cases regardless of the particular circumstances.